Comparing iOS and Android – Which one is Better ? 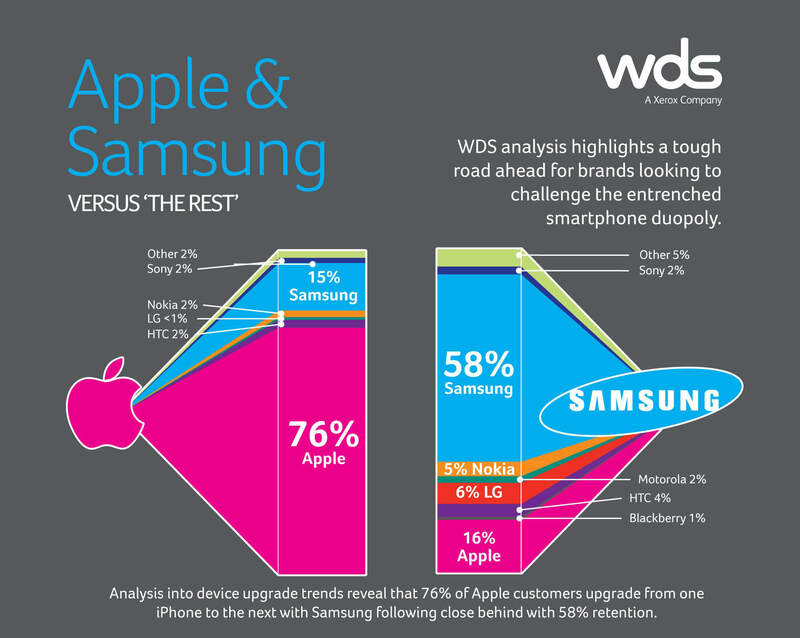 The top 2 contenders in the battle for mobile phone platforms have always been unambiguous. Apple’s iOS and Google’s Android have developed rapidly over the years and is still continuing to surprise its ardent users and followers with new additions annually. Both platforms have their own pros and cons in keeping up with the technological changes. iOS – This is a mobile operating system developed by Apple Inc and is the foundation of the company’s iDevices – iPhone, iPod Touch, iPad, iPad Mini and Apple TV. Versions of iOS are released annually while the latest being iOS 8 which was released in September 2014. Android – This mobile operating system is currently developed by Google and is based on the Linux Kernel which is a prominent example of free and open source software. This platform is also popular with many techies which require low cost, ready made and customizable operating systems. However, since the introduction of Apple’s iOS 8, we think that Apple users may have a slight advantage. With its distinctive style and higher price, Apple products with the iOS platform have managed to create a niche user base. But Android has managed to gain the upper hand when it comes to the selling rate of products. 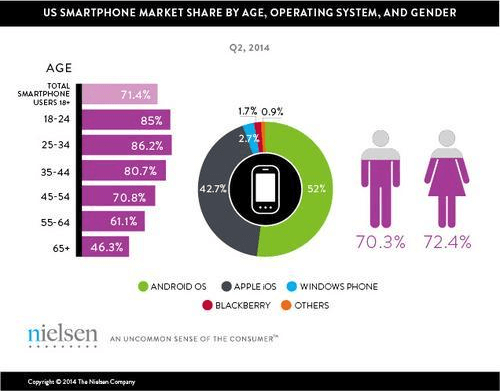 The graph given below indicates the US smartphone market share by age, OS and gender. With the latest Android version being announced and that too boasting of a gamut of new features, users are faced with the dilemma of choosing the best OS which will suit their requirements. Check out the following main comparisons and decide for yourself. Users have gradually started giving up on complex designs and the age has dawned for complete minimalism. Both platforms have been well prepared and offers users a very simplistic design making it easier to use. Apple’s iOS 7 underwent a major design refurbishment which was considered a must at the time. However, comparatively iOS 8 has not gone through any significant upgrade as far as the design is considered. Apple’s signature clear glass effect remains the same. Google’s design language which is called ‘material design’ is quite consistent across Android, Chrome OS and Google Chrome. This adds depth which makes everything look as if its animated. A layered design is expected in Android L which will be introduced in the near future. The battle ends in a draw! Apple’s phones and tablets have very few models while only Apple itself has the authority to control the hardware design. What Google does is that it simply develops the OS while they do not force specific standards on Android Device manufacturers. However, Android hardware has come a long way and it has improved from where it was. Apple wins the battle here with its hardware efficiency! Both iOS and Android use a touch interface that actually have a lot in common if you had noticed – Swiping and tapping etc. Both OS’s boot to a homescreen which is what you would find in any regular PC. The Android home screen allows users to make use of widgets which display auto updates such as emails, the weather etc while the iOS home screen only contains a row of application icons. However, the iOS interface contains a dock where you can pin your most frequented apps. Status bars are available in both which offers users battery life, cell signals, messages, reminders etc. It’s a close call and there are no winners here! iOS users have an advantage when it comes to software upgrades. iOS upgrades are usually available in all iOS devices but there could be an exception for devices which are older than 3 – 4 years or for features like Siri. Hardware capability becomes the only reason that some devices may reject upgrades. Google does update for Android frequently but many users do not receive their updates as regularly it seems. The reason being that phone manufacturers have the authority to decide when and whether they should offer software upgrades. The latest Android upgrades are not offered for all phones and tablets while even when it is offered it might be after several months following its release. Apple is the clear winner! The Apple app store offers 700,000 apps currently. It is a known fact that most developers prefer to develop gaming apps for iOS before they develop for Android. There are a number of exclusive apps available in iOS which includes Tweetbot and Infinity Blade. Android however gets its apps from Google Play which at the moment offers 600,000 apps. There are instances that some Android devices such as Kindle Fire use separate app stores. A number of original iOS apps such as Pinterest and Instagram are now available for Android users. Android also offers users access to Google based apps which includes Google docs and Youtube. Both platforms have popular apps but when considering tablets, more apps are designed for the iPad. Most smartphone apps are developed mainly focused on one platform while later on they are upgraded to serve multiple platforms. Credit goes to both OS’s! According to Crittercism which has analyzed data across a number of iOS users, the crash rate of iOS 8 landed at 3.56% while the same devices running on iOS 7.1, apps only crashed 2% at the same time. Crashes are a result of bugs in iOS 8 and various buggy apps and over time, upgrades will be able to lower the crash rate. A benchmark report also states that Android KitKat was more stable that iOS 7 while its crash rate was only 0.7%. However, you should also know that phone versions of both iOS and Android are more stable than their respective tablet versions. iOS is solely available on Apple devices – the iPhone, the iPad and the iPod. These devices also tend to be quite expensive compared to Android devices. However on the other hand, a wide variety of Android devices by various manufacturers are available with varied hardware capabilities, sizes as well as price. Android wins for variety! Apple holds on to its classiness. iOS uses Safari as its web browser while Android uses Google Chrome. Both browsers have similar features and are also similar in quality. Safari is not available for Android devices while Google Chrome is available for iOS. Apple gets a slight advantage here! ‘Siri’ is a voice based virtual assistant introduced by iOS with the ability to understand and respond to voice commands. Many features are available while some of them even include making reservations at restaurants and locating movie times in local theatres. Users also have the option of dictating text messages, emails and even interfacing with car audio and navigation systems. There is a similar assistant offered by Android – ‘Google Now’ which also includes the above features including verbal reminders. Voice search and dictation is also allowed. It ends in a draw again! Android which is the more popular smartphone operating system is more likely the focus of attacks. Android’s applications are isolated from the rest of the system’s resources making the system less vulnerable to bugs. However, this means that many apps request for unnecessary permissions while there are instances that the user may send personal information to third parties without knowing they did. 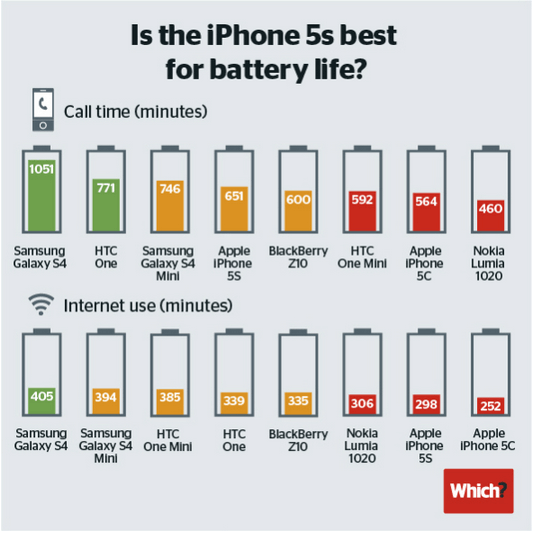 Apple undoubtedly has the upper hand here with results showing that the OS commands brand loyalty. Apple users are likely to buy another iPhone rather than switching brands. These were some of the main comparisons that we thought were important. Both platforms have either unique or similar features enabling users to enjoy their favourite device. Let us know what platform you prefer and who you think is winning the battle. Your ideas matter to us.